Black Rock Journals (this one is reversible!) feature idiosyncratic cover designs ranging from fresh and funky to sublime. 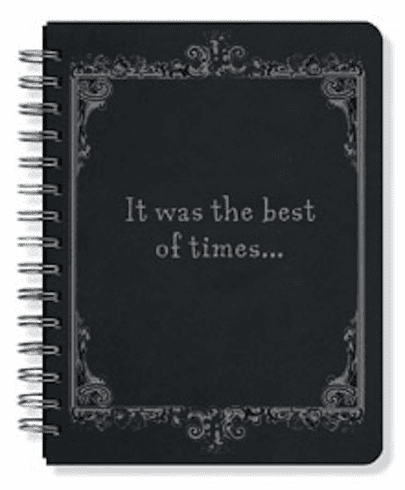 As original as your writing, Black Rock Journals are the ideal marriage of attitude and pragmatism. These journals are incredibly durable, totally practical, always individual. Black Rock for people who actually use their journals. Ultra-stiff black board covers that serve as writing boards with debossed foil stamping and crush-proof rounded corners; wire-o binding lies flat; elastic band place holder; 160 lined pages; hardcover; 6-1/4 wide x 8-1/4 high.